For the 2019 Popcorn sale, Black Swamp Area Council is partnering with Trail’s End for both the Show & Sell/Take Order and the Online sale. This exciting opportunity will provide a single-line of products for the entire sale this year. Additionally, Trail’s End offers a wealth of training and best-practices. The company’s popcorn sale app gives unit leaders the ability to have real-time data of their sale and track inventory overall and by Scout. 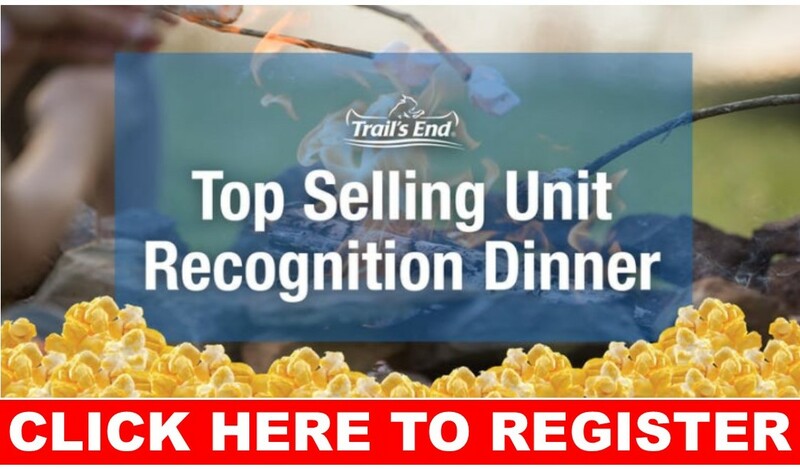 For units who participated in the sale last year, you should have received an invitation to join us at one of the three popcorn dinners to celebrate and learn more about the upcoming sale this Fall. For units that did not sell last year, see below on how to participate this year. Units are invited to participate and learn more about our new vendor as well as be on hand to recognize our top popcorn selling units in Black Swamp Area Council. You're invited to an exclusive dinner to celebrate popcorn success! Registration is currently limited to 2 attendees per unit. If you would like to bring additional leaders from your unit to the event, please fill out that portion of the form during registration. Requests are not guaranteed. Someone will follow up with you via e-mail if the request is approved. Please note, “Eventbrite” is the service provider for online registration, and e-mail confirmation. Lastly, dinner is FREE, but we need you to register prior to the event! If you were unable to register online or your units did not sell last year but wishing to participate this year, please e-mail Jim Mason your unit type (Pack, Troop, Crew, Post) & number, your name, phone number and e-mail address to be added to the list, as well as which dinner you want to attend.